Though we interact with them dozens of times a day, we rarely notice our home’s light switches and outlets. But these fixtures can be a decorative element as important as your choice of carpet or wall art and have a dramatic influence on how well your decor vision comes together. Upgrading your light switches and outlets should be included in any home renovation. Take the following factors into account as well when making a purchase. Plastic isn’t your only option when it comes to selecting light switches and outlet covers. Today, these electrical fittings are made with a variety of materials, including wood, aluminum, glass, stone, marble, laminate, leather, and stainless steel. Manufacturers combine these materials in designs that reflect almost any aesthetic sensibility, from warm and natural to bold and flashy. Whether your home decoration style is traditional or trendy, complimentary light switches and outlets will help tie it together. Colors and patterns are an innovative way to bring more visual interest to your switches. Many switches allow you to change out colored veneers and graphic patterns as easily as switching your smartphone case. You can customize the look of these fittings to match each room or rotate them to fit your mood. The wealth of possible combinations makes it fun to experiment and see what styles best suit your creative concept. And as interior design styles change with the times, you’ll be able to adapt the look of your home right along with them. 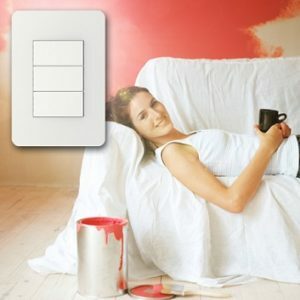 A light switch’s design also determines how it operates the lighting connected to it. Most everyone is familiar with the rocker switch, which has clear set on and off positions. But there are a variety of switch designs to choose from. Dimmers, for example, allow you to control the amount of light emitted by a fixture, are ideal for dining areas and other rooms that require ambiance. Other switches include motion sensors to automatically turn lights on and off based on detected movement and are great for energy-conscious homes. You can use a combination of switch designs through your home to suit your needs. Before you purchase any new light switches or outlet covers, do a walk through inspection of your home. Think about what styles, colors, and finishes will complement each room’s decor or mood. Also think about how the lights will be used in each room so you can select the appropriate switch design. Stylish, well-crafted switches and outlets are an integral part of your home’s interior decor. Keep these considerations top of mind when shopping, and your electrical fittings are sure to light up your home.